Prefabricated stainless steel crowns for short- or long-term adult posterior use with proven clinical success. 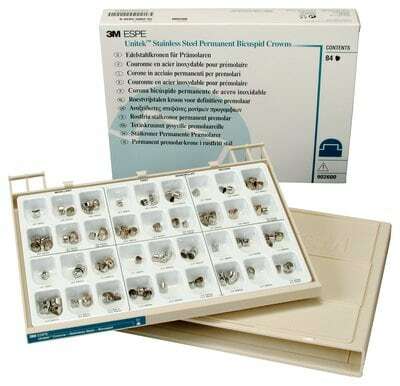 Permanent bicuspid set contains 84 crowns in assorted sizes and is packaged in a stackable storage tray. Please refer to the resource section to view the Prefabricated Crown Order Form which is designed to help with identification and ordering.